Panasonic has just released their third Micro 4/3 model, the DMC-GF1. While the Micro 4/3 system is shared by the both Panasonic and Olympus, Panasonic was the first to release a M4/3 camera with the introduction of the DMC-G1 just one year ago. 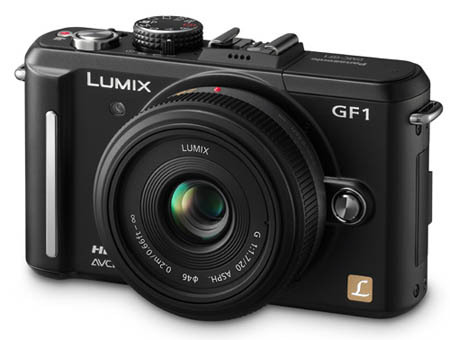 The GF1 is the smallest Lumix G series model yet, sharing a slight resemblance with Olympus' E-P1. The DMC-GF1 will be available in early October for about $899.95, and comes in two kit configurations (both are the same price). Option one includes the Lumix G 20mm/F1.7 ASPH, while option two includes the the Lumix G VARIO 14-45mm/F3.5-5.6 ASPH/MEGA O.I.S. The optional DMW-LVF1 will retail for approx. $199.95; while the DMW-MA2M and DMW-MA3R both have an price tag of about $249.95. Panasonic has also announced two new compact lenses, including the world's first Leica Micro 4/3 lens. The Lumix G 20mm/F1.7 ASPH "pancake" is a fast, compact lens that Panasonic claims offers outstanding brightness. The LEICA DG MACRO-ELMARIT 45mm/F2.8 ASPH/MEGA O.I.S. offers an equivalent 90mm filed of view and includes Panasonic's proven MEGA O.I.S. (Optical Image Stabilization) system. Both lenses allow for use of the GF1's advanced contrast AF system, including face recognition. These new models will be available in early October, The Lumix G 20mm/F1.7 ASPH lens will have a suggested retail price of $399.95, the the LEICA DG MACRO-ELMARIT 45mm/F2.8 ASPH/MEGA O.I.S. lens will retail for about $899.95. Click Here to learn more and read Panasonic's press releases. Last edited by DonalDuc; Sep 6, 2009 at 3:32 AM. Our full hands-on review is now live, be sure to check it out.